We thought that choosing the lighting scheme for our own bathroom is an easy task. But then you would somehow realize that the types of lighting that you will install in your bathroom are very important. 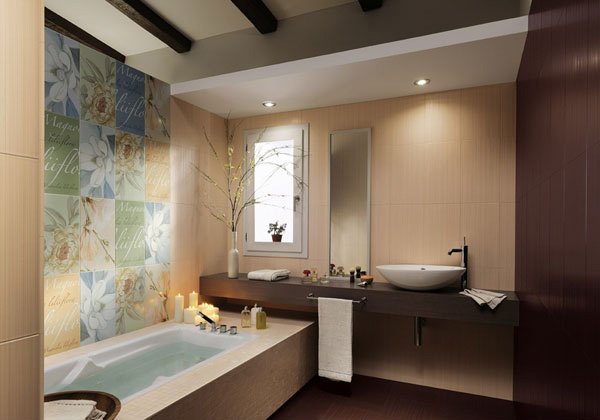 It is necessary to consider its effect in the entire bathroom as you have your chosen theme or concept as well. 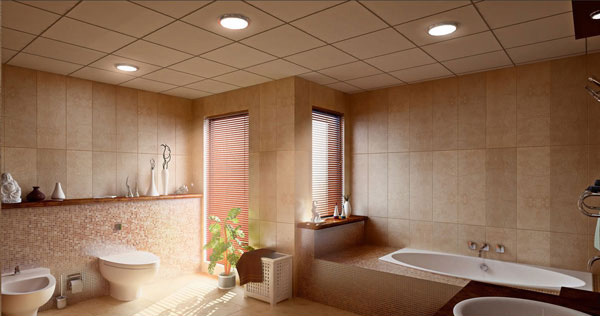 That is why lighting is one of the most essential elements for a bathroom. As we know, it is not just the source of light but it also has the capability of setting up the mood of the users. The lighting materials that we will choose can surely create a different and unique accent in our bathroom. 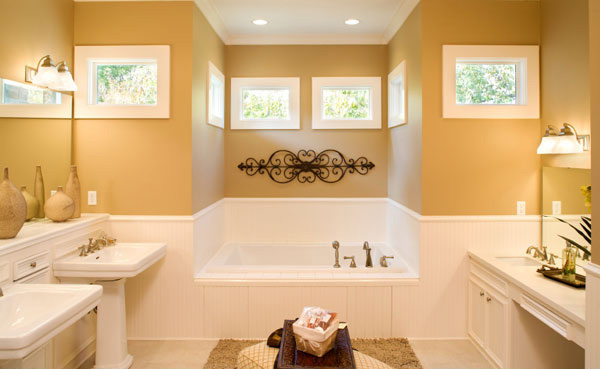 It has the power to make a simple bathroom design into a luxurious one. 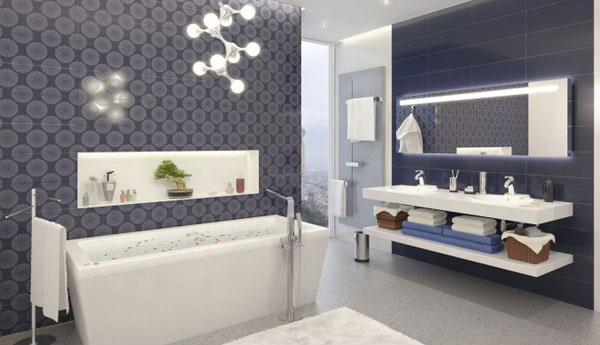 Now as we have collected different amazing bathroom lighting designs, we are hoping that you will get an idea and be inspired for the design of your bathroom. Why don’t you scroll down the page and witness the Bathroom Lighting Ideas below. The lights used in this bathroom makes the pink paint color shimmer underlining its smooth texture. 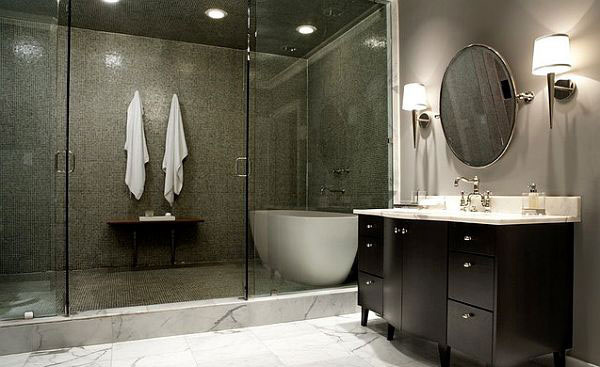 The lamp installed beside the mirror is an effective idea to come up with a contemporary style bathroom. With the lights and lamps placed in every edge of this bathroom, it adds more brightness to the beige color of the palette used in the walls. 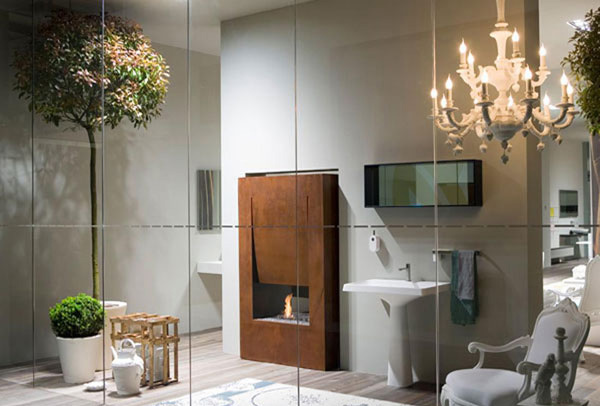 The lights as well as the candles set in the bath tub create a romantic mood in this modern bathroom. The simple lights installed in the side of this bathroom and the lamp near the powder area is enough to set a relaxing mood in this bathroom. Despite of the low ceilings in this bathroom, the lighting used here contributed much in providing enough light in this area. The chandeliers in this bathroom is enough to serve as the source of light and adds more grace to the space here. 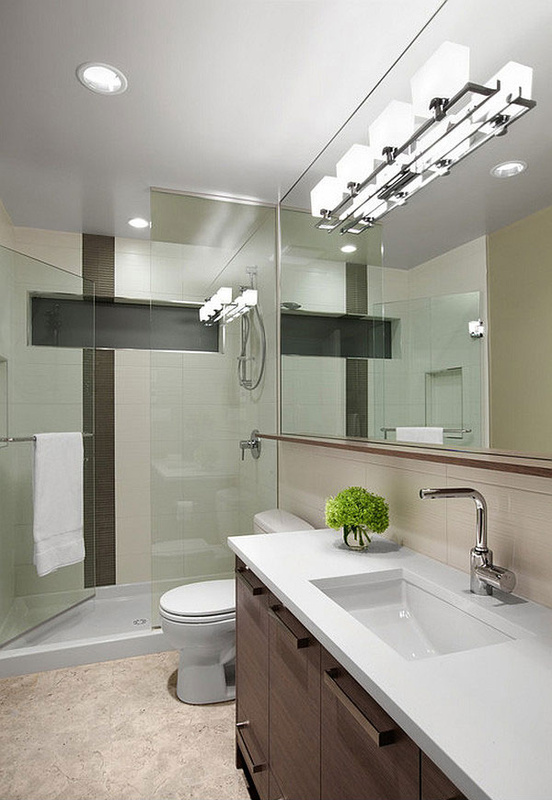 The incandescent lamp placed in the mirror underlines the modern look of this bathroom. 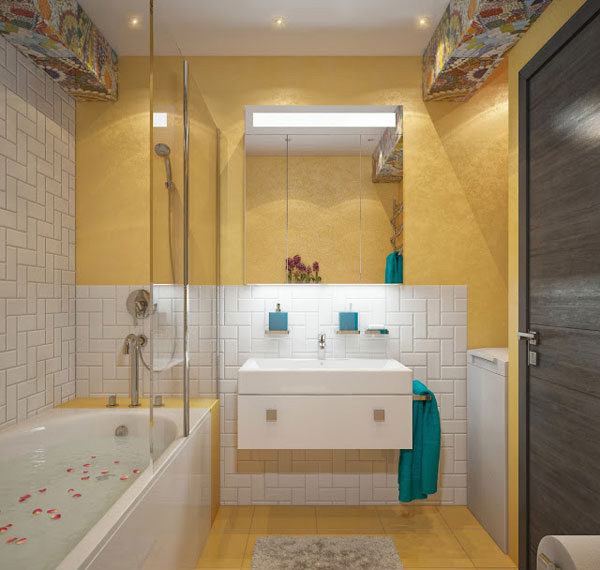 The lights placed in this yellow and white bathroom makes this space look bigger. You may notice how the designers install the lights in the ceiling of the shower area of this bathroom. 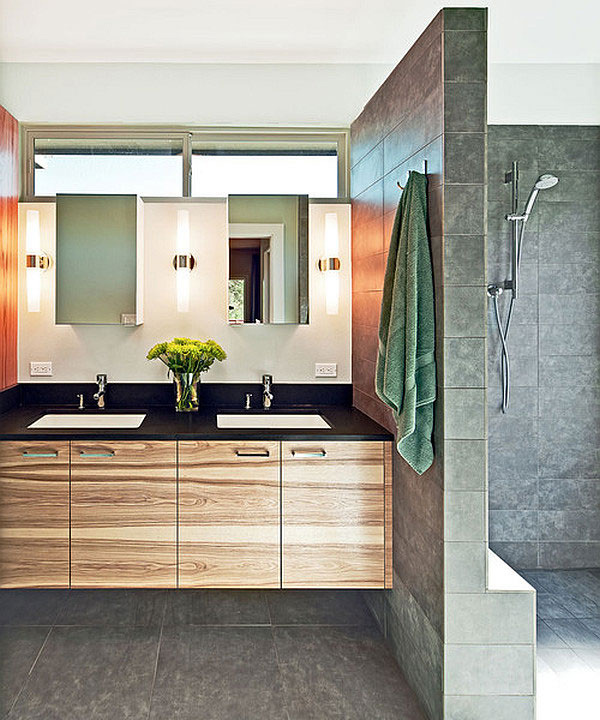 The modern type of lamps is utilized in this contemporary yet simple bathroom. 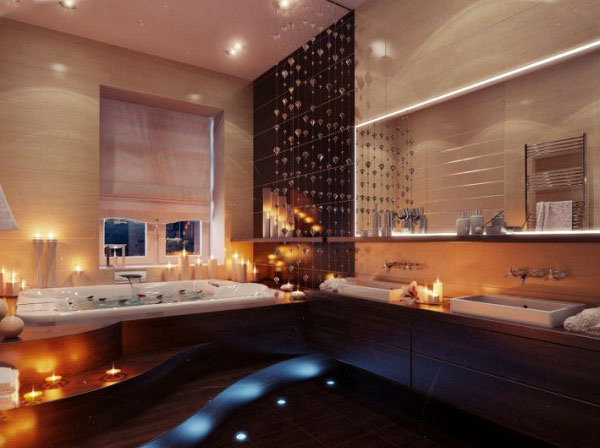 Combination of candles and LED lights are enough to set this place into romantic bathroom. 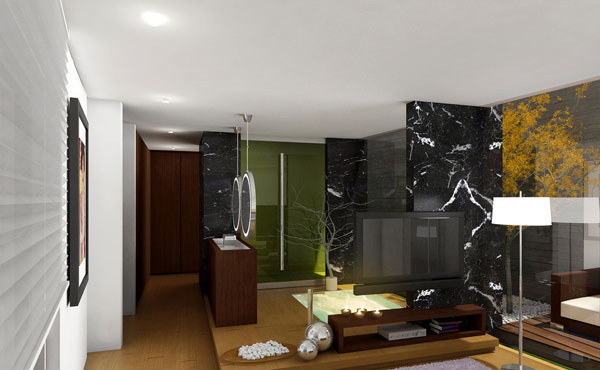 The lights may be dim but it is better to highlight the wall tiles used here. The amazing and luxurious chandelier placed in this space is very efficient to highlight the different elements used by the designer. The different textures shown in this bathroom is well presented with the help of these lighting materials. Typically, many of us tend to install a centralized lighting in the middle of a room. But this will just show a plain appearance for our bathroom. So as you can see in the above bathrooms, different designers come up with a different ideas on where to place the lighting. They didn’t focus by just putting the lights in the middle but instead they placed it near the bath tub, windows, powder area, above or below the mirror. Also they didn’t use only one lighting but they re-invent to make use of multiple lightings. This is to emphasize every detail of these bathrooms. Yet the designers successfully showed their great talents and skills of utilizing the lighting materials to make their designed bathrooms stand out among the others. Aside from the bathroom’s lights, you might also want to check on some bathroom storage ideas to keep your bathroom organized.